Additionally, from 2010 to 2013, Will was a partner with a strategic advisory firm, Crumpton Group LLC, where he provided leadership across the full range of Crumpton Group’s service offerings—helping companies capture opportunities in international markets while managing risks to their physical assets, intellectual property and human resources. Prior to returning to Texas in 2010, Will served for almost a decade as an undercover officer at the Central Intelligence Agency. At the CIA, he worked at the nexus of some of America’s most important national security issues leading intelligence operations on counterterrorism, cybersecurity and other critical threats. The majority of his career was spent overseas in South Asia and the Middle East where his primary mission was the recruitment of foreign assets, collection and dissemination of intelligence in support of the President and senior government policymaker’s national security decision making. Will has the pleasure of serving on a School Advisory Committee within the Northside Independent School District (NISD) and he had the honor of being recognized as one of NISD’s “Pillars of Character” for the 2011-2012 school year. 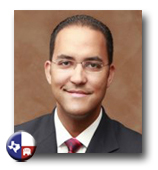 He is also a board member of the World Affairs Council of San Antonio. A native of San Antonio, Texas and the youngest of three siblings, Will graduated in May 2000 from Texas A&M University in College Station with a Bachelor of Science degree in Computer Science. While at A&M, he served as the President of the Student Union and was elected Student Body President. "My future job title will be United States Representative, and I take that very seriously. It means that I work for the people and not the other way around."